Divided Politics, Creaky Economy Put Egypt On Edge More than a year after its revolution, Egypt is still struggling for direction. The country holds a runoff Saturday and Sunday in its first competitive presidential election, and the choices show the country's divide: One candidate is from the Islamist Muslim Brotherhood; the other, a former prime minister in Hosni Mubarak's regime. 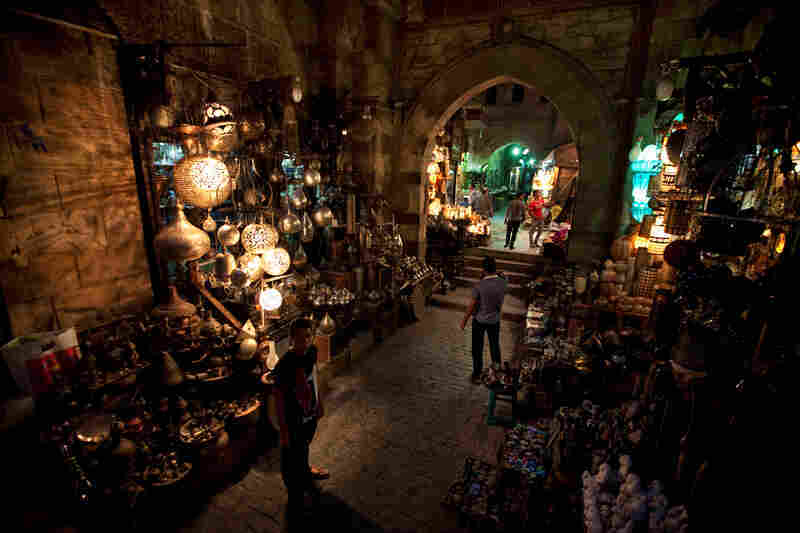 The Khan el-Khalili market in downtown Cairo. 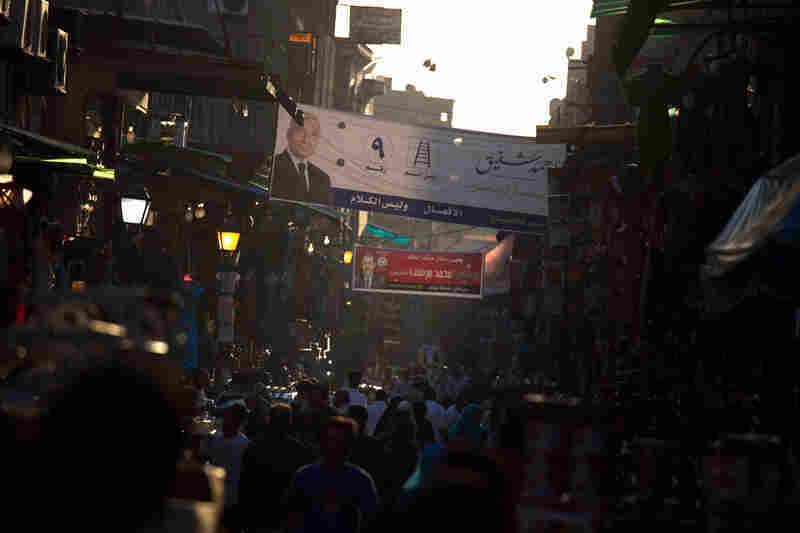 Election posters for the two candidates in Egypt's presidential runoff election are hanging above the street. In the Khan el-Khalili market, cafe owner Hassan El Halwagy (left) thinks that Islamist groups are not qualified to run the country. The Khan el-Khalili market in downtown Cairo used to attract many visitors, but tourism is down sharply since last year's revolution. At the market, a small group gathers to watch England play France in a soccer match at the European championship. They're rooting for England. 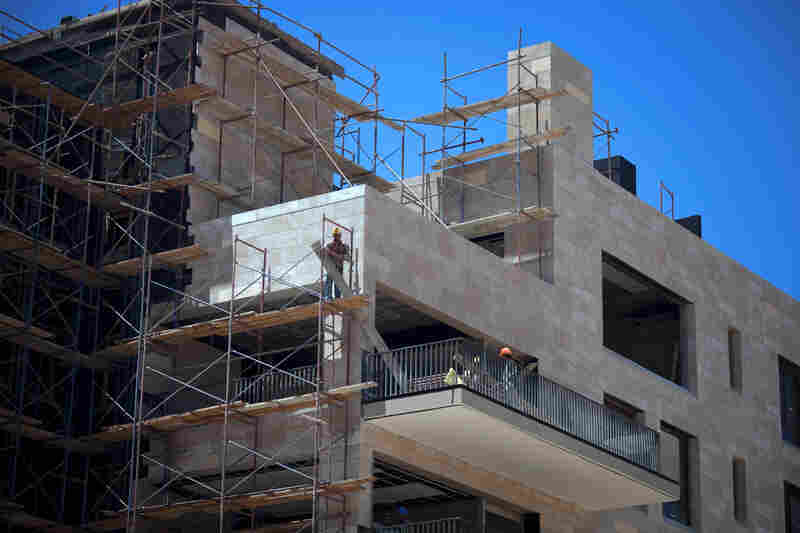 Building construction in the upscale SODIC housing development outside Cairo. 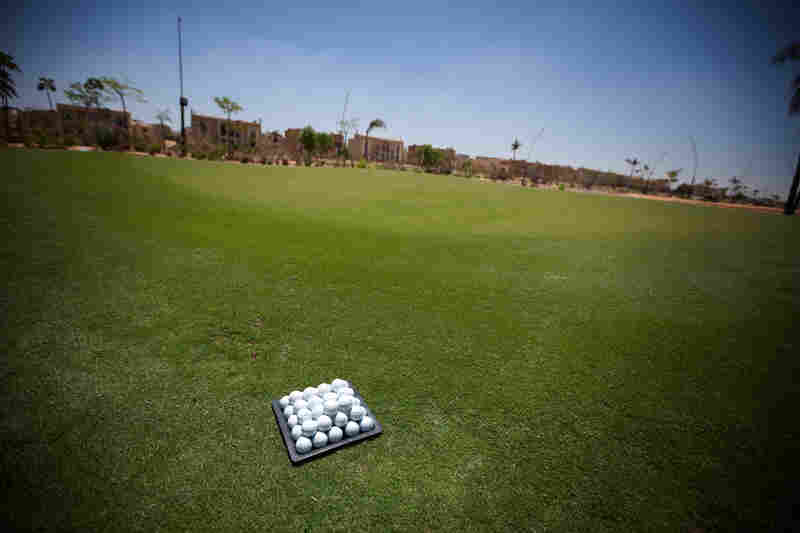 A golf course designed by Greg Norman is the centerpiece of the new SODIC gated community under construction on the outskirts of Cairo. 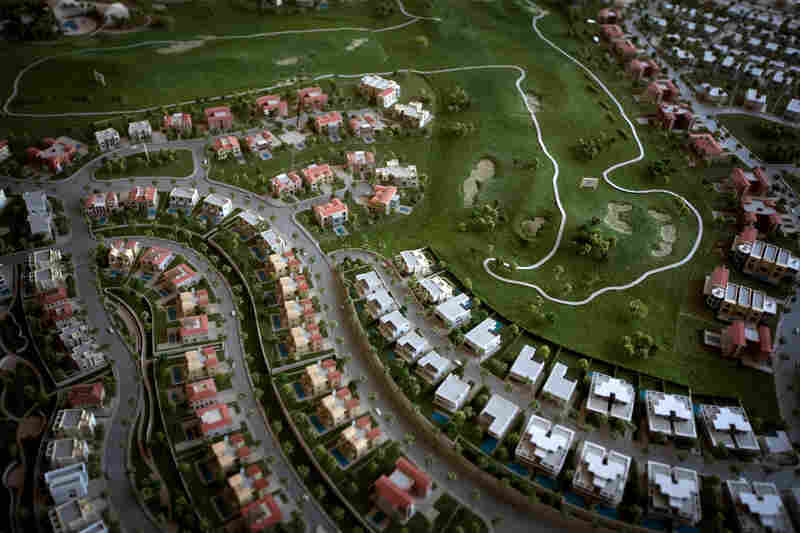 A scale model of the SODIC development outside Cairo. We stopped at an auto-repair shop that had a gas pump out back, an ancient analog machine with numbers on wheels. We could see the gears because the cover was gone. An attendant came over but couldn't make it work. We drove on. Miles later, when we reached a filling station at dusk, the attendants declined to sell us fuel. They said they were out of it. Then a man who was standing around in the parking lot told our driver he had fuel for sale, and that we should follow him. A few hundred yards along in the desert, he stepped into a miserable old shack and emerged with two plastic containers, about five gallons each, full of gasoline that he siphoned into our car. It seemed that he was a gasoline bootlegger who had obtained his supply from the same filling station that had none for us. It was hard to understand how this made any sense, but we reached Alexandria, that day's destination, just the same. Egypt's economy may be a corroded and rusted machine, only partially modernized during the rule of the last president, Hosni Mubarak, but people find ways to make it work. Since Egypt's revolution, however, many people have had a harder and harder time getting by. And while Egypt's first genuine presidential election is fundamentally about political freedom, many people are thinking of their pocketbooks as they vote. We asked about this once we reached Cairo, the great metropolis of the Arab world, whose old city has now become a vast market, where, in better times, tourists would flock. But in the year and a half since the revolution, business has been bad. "Very, very bad," says restaurant owner Hassan El Halwagy. We found him sitting at one of his outdoor tables, watching tourists not pass by. Scenes from the Khan el-Khalili market in downtown Cairo. Karim Gomma (right), a shop worker, says he's voting for the Muslim Brotherhood candidate, Mohammed Mursi. But he says most shop owners are voting for Ahmed Shafiq because he has promised to restore law and order. The presidential election on Saturday and Sunday doesn't reassure him. Especially because one of the final two candidates comes from the party linked with the Islamist Muslim Brotherhood. "They are stupid, ignorant, uneducated, everything," he says. "They are talking about religion. They cannot do a proper work to control a country." And he fears that if the brotherhood wins power, they'll never give it up. The brotherhood has already won the parliamentary elections, held back in December and January. And the first round of Egypt's presidential election, held last month, left voters with a stark choice: a candidate from the brotherhood, Mohammed Morsi, and a former prime minister linked to ex-president Hosni Mubarak and Egypt's powerful army, Ahmed Shafiq. Many business owners here favor the military's man, who promises to get tough, restore order and give business something to celebrate. We passed women in this market celebrating the purchase of a wedding ring, as men hammered out designs in metal plates. We walked through carved-stone archways, gates in centuries-old city walls, which people once relied on to keep out trouble. Medieval rulers built walls within the walls, turning each neighborhood into a gated community. The farther we moved, the narrower the streets became, until they felt like hallways, where men waited for a chance to sell string instruments called ouds, or killed time on plastic chairs watching soccer on TV. As they waited, they talked. And we constantly overheard the names of the presidential candidates — Morsi, Shafiq, Morsi, Shafiq. 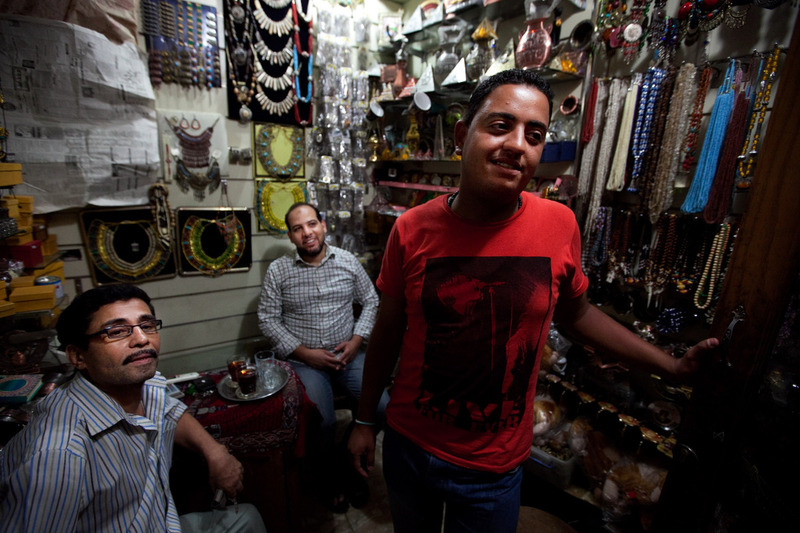 A jewelry store employee, Karim Gomaa, says, if we elect Shafiq, why did we have a revolution? People who vote for Morsi are deluded, the shop owner says. As we cross this city, we find many people trying to make sense of the country's upheaval. Their new freedom has come at a cost, forcing many to adjust their economic expectations. So we slip out of central Cairo at the tail end of the morning rush, creeping along a highway with presidential campaign billboards along the entire length of it. We reach the Alexandria Desert Road, out into the desert as the name suggests, connecting Cairo with ever-spreading development as this city expands relentlessly. We arrive in a new suburban gated community where construction crews are at work under the direction of an Egyptian company called SODIC. We're standing on a green lawn, and yet right across the highway is desert, absolute desert. Dasha Badrawy, the company's chief business development officer, drives us around the development. "So this is the project called 40 West that I was telling you about, and now this is Beverly Hills," he says. The Beverly Hills homes are not really on a Beverly Hills scale. But other neighborhoods in this development feature multimillion-dollar houses. Down the street you find a mall, an international school, a golf course designed by two-time British Open champion Greg Norman. The fairways are surrounded by elegant new homes with acres of glass, awaiting the next errant shot. This kind of development flourished in the last years of Mubarak's rule. And when you hear how Badrawy's company has adapted to post-revolutionary times, you learn a lot about a changing Egypt. "Pre-revolution, Egypt was looking at a period of very high economic growth, lots of affluence, there was an emerging middle class," he says. "There were investment bankers in multinational companies that were paying heavy salaries. So we were looking at 8 percent economic growth, and people's aspirations were high." But, he adds, "since the revolution, there's been a bit of a reset." After the revolution SODIC's former chairman disappeared amid corruption charges. Prosecutors, however, said the company wasn't involved, and it continued construction. "I think we've shown ourselves to be resilient; the economy is still standing on its feet, barely," Badrawy says. And pointing at a giant scale model of the community, Badraway shows a new neighborhood that's still upscale, but designed for leaner times. The houses are smaller, the prices are lower, and they're marketed to appeal to people seeking safety. "Security has become a big issue in the last year and a half," he says. "Now there are incidents, and so I think one of the reactions of these people to new circumstances is, 'What about security?' "
Residents pass through two guarded gates on their way home. 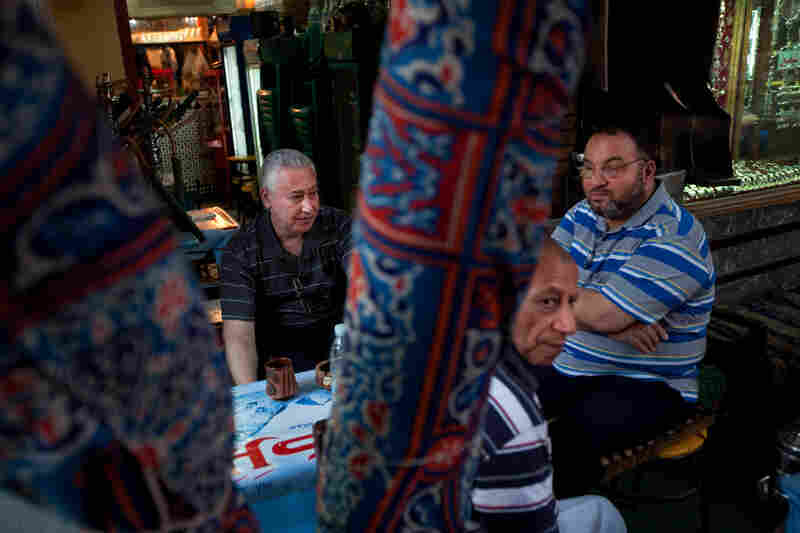 They can live many miles from the crowded streets of central Cairo, and the political turmoil of Tahrir Square. Even in this economy, SODIC reports sales are up sharply. Badrawy sees hope in that, hope for his company and for Egypt, though he still sees challenging times ahead. They are some of the hardest since he moved here 12 years ago from London. He says the Muslim Brotherhood is strongly pro-business but may not do well in the long term. And if the army's candidate wins, he worries about protests and social disorder. I asked if he might return to London? "Well, let's put it this way, I'd be very concerned if the Islamists get in," he says.